The Arizona Cardinals got a big-time performance from cornerback Patrick Peterson in their Week 6 win versus the Tampa Bay Buccaneers. 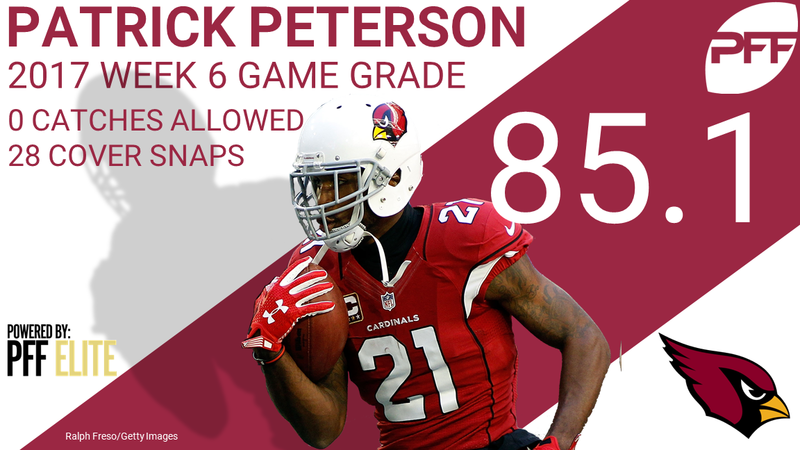 Before leaving the game in the third quarter with a quad injury, Peterson earned a game grade of 85.1, completely blanking the Buccaneer’s offense on 28 cover snaps. Shadowing Mike Evans for most of the game, Peterson didn’t give up a single catch to him while being targeted four times. Peterson also came up with a pass breakup while defending Evans. It’s no surprise Evans didn’t catch his first pass until after Peterson left the game. On the season, Peterson has allowed just seven receptions on 219 coverage snaps for an incredibly low yards per cover snap allowed of 0.37 that ranks second in the NFL among cornerbacks that have played at least 125 cover snaps.